Rockstar revealed earlier this week that Grand Theft Auto V is on its way to the PC and next-gen consoles this fall. 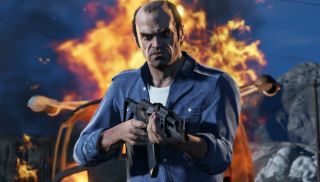 You may now throw your money at it, and Rockstar has a handy site all ready to take that money. Just nip over to rockstargames.com/V/order , select your platform and retailer of choice, and then get out your wallet. Links to retailers outside the U.S. don't appear to be working at the moment—it doesn't seem to matter which country you select, the only listed sellers are Rockstar, GameStop, Amazon.com and Best Buy. Oddly, GTA V isn't listed on Steam yet, although that situation will no doubt be resolved in short order. No release date has been announced at this point, either. Amazon and GameStop both have it dated for December 31, but that's obviously just a placeholder; Rockstar says it will be out sometime in the fall.